The courier delivery industry is one of the rapidly transforming sectors. The numerous technical transformations have been seen in this sector in the last two decades. Earlier, the parcel often lost in the way or remained stuck in the heavy traffic due to transportation issues. The sender and receiver have to bear the loss. But the uber for x model has brought so many technical transformations in this market segment. Earlier, the business owners have to think twice before investing in marketing as there are already many other expenses associated with this courier pickup and delivery services. But now online courier delivery system provides a marketing platform to them through which they can directly connect with the potential and new customer very easily. They can stay engaged with their customers by sending a real-time notification related to the latest offers, discount vouchers or loyalty programs held by them. In this way, they can build their online business presence with on demand courier service app development services. The courier delivery companies generally face difficulty in tracking the tasks of their employees. It was impossible because generally, the delivery agents have to deal with the problems due to traffic jams or vehicle breakdown etc. But now through courier delivery business management software, they can view the movement of the delivery agent in real time mode. They can call or chat with them via in-app calling and chatting feature. Moreover, the delivery agent has no need to move here and there to search the location of the customer. The customized courier app development services provide the solution to this problem. The courier delivery app builder provide the software in which Google maps are integrated to trace the customers address. Next, to attract the new customers and retain the potential customer, the first and foremost thing is to analyze the niche market. Like from Australia, UAE, US regions, there is demand for zoom2u app clone, wing courier app clone and parcel delivery app clone. It means they are already leading in the race through online courier delivery system. Sometimes the owners have to hire third-party courier companies to manage daily delivery operations which have some problems in itself. In that case, on demand courier delivery app development becomes the perfect solution as you can effortlessly manage your in-house delivery team online through a single dashboard. 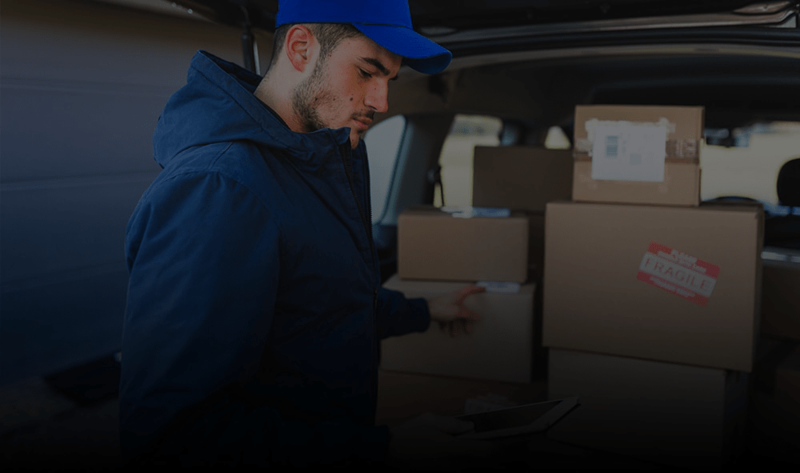 Courier service platform development solutions can help you track and schedule daily deliveries, generate daily business analytics report and optimize ROI. You can eliminate all roadblocks that come in the way of your smooth journey to success. If you are searching for reliable courier delivery business app development company, We will suggest you hire the team of courier app developers who can help you to build an online business presence with customized courier app development services. You can choose an experienced team of courier delivery app builder at Goteso who are assisting the clients across the globe with top-rated courier service platform development. If you are ready to improve your delivery business performance through on demand app, get in touch with top mobile app developers right now. We have readymade custom web and native app solutions which can fulfill every need for courier delivery business app model. We help the entrepreneurs and courier company owners to build their startup and courier delivery marketplace. Manage your all courier delivery branches with a centralized dashboard. Now, you can easily track the sale of each company. Execute your business processes from single courier company and satisfy the customers. Before getting started to use the application, the customers (sender and receiver) can view the key features and benefits of the app with onboarding screens. The customers can create their account by entering their name, contact details, area code, address and other details which can make the delivery agent to trace them. They can also use their social media account to log in to the application. The customer can schedule the delivery and pickup time of the courier as per their own comfort. They can even change the timings if the receiver is not available at that time. The customers can track the real-time location of the parcel until it reaches the receiver's address. It boosts their satisfaction level as they can check the real-time status of their valuable assets. The customer can calculate the parcel and shipment charges automatically through the app. The customer can add the receiver's details like their name, address and contact information. They can also add their neighbor's details if the receiver is not available to receive the parcel. The customer can receive the real-time notifications regarding the delivery updates including estimated time duration of courier delivery. The customer can view the status of all previous parcel delivered or received, their bills, and status (processed or delivered). They are able to monitor every detail associated with their parcel delivery. Customers can select the size of the vehicle based on the parcel they have to deliver. They are also provided with an option to fill the size and weight of the item to deliver. The customers have an option to add multiple addresses for parcel delivery or parcel pickup in the address list and they can choose any of the address while placing the request for the delivery. The customers can take advantage of various offers and discounts available on their package delivery. Customers have an option to share information about service on social media or other messaging apps if they are satisfied with their delivery service. Customers can instantly get the digital copy of the parcel bill at their email id. All information like order id, shipment charges etc will be present in it. Customers are facilitated with an app integrated with multiple payment gateways. They can pay for the service through online net banking, stripe, Paypal, credit cards, debit cards, PayTm and bitcoins (Blockchain based payment processing system). The customer can rate or give the feedback about your company as per their experience with your service. It helps the new customers to choose a high rated company for their parcel delivery. The customers can directly interact with parcel delivery agent or support team through the in-app integrated messaging or calling option. It increases customer-delivery agent engagement. Admin can manage the multiple courier delivery service branches under the single panel. They have the access to add or delete any branch in the listing. Admin can effortlessly edit the list of delivery agents or other staff members with unique employee id. All the records like their salary, payments, attendance are managed under a single platform. Admin can easily view and modify the list of delivery agents. They can view the cost taken by each delivery agent from the customer while pickup and delivery. Admin can beautifully represent their services with the gallery filled with eye-catching relevant images. They can add or delete any of them anytime. Admin can keep the track of the parcel right from its pickup to delivery. it helps them to keep the customers updated with their parcel's real-time status. Admin can edit, view and manage the customer records. It helps them to ensure that customers are served in the best possible way. Admin can send notifications to their past and current customers regarding the special events or discounts vouchers to retain their loyalty. Admin can send alert to the customer to stay them updated with pickup and delivery time of the courier. It eliminates the waiting issues faced by the delivery agents. With multiple payment gateways integrated app, the admin can receive the payment through plenty of ways like a debit card, credit card, net banking, PayPal, Stripe, Bitcoins (Blockchain based payment processing system) and Paytm. Admin can view and delete the ratings and feedbacks given by the customers regarding the courier delivery service. It is a good way of customer engagement. App integrated analytical reports help the admin to monitor all the issues related to the business and make the further plan accordingly. Through courier delivery software, the admin can analyze its business growth in-depth. They can get the real-time statistics of revenue earned by courier delivery agents, daily parcels transacted etc. The courier branch managers can easily handle the data of all staff members like vendors, delivery agents or managers etc under the single panel. They can keep an eye on their daily activities like their attendance, expenses, wages etc. The courier branch managers can view and modify the list of delivery agents on the single online platform. They can also manage the courier shipment cost including the offers, discount vouchers etc. provided at their branches. The courier branch managers can update the current status of every delivery agent whether they are busy or free. They can keep track of their updated location through Google maps. The courier branch managers can access the details of every customer availing the online parcel delivery services. They can view and modify the list of all the existing and new customers. During the offers, discounts or loyalty programs organised by the courier branch managers, they can notify the customers by sending the notification to them on their smartphones. The courier branch managers can generate insightful reports and animated graphs which help to make smarter future decisions for successful business execution. The courier branch managers can manage the parcel received and to be delivered under the panel. They can update whole of the associated information of the courier like their sender name, receiver name, their address and delivery time etc. The courier branch managers can deeply analyze the business performance through business analytics. These statistics provide them the real-time market scenario. The branch manager can access the record of daily parcels received, delivered and revenue earned by each delivery agent. It gives them the better estimation of business growth. The branch manager can resolve the queries of customers and delivery agents through in-app chat and calling. Even customers can get real-time updates of their parcel's location from the manager. The delivery agents will get the notifications on newly assigned parcel delivery order, which is to be delivered by them. They will update the status as processed and on delivering the order, the status will be changed as delivered. With the help of google maps and GPS, the delivery agent can easily track the live location of the sender and receiver and can find the way to the destination. The delivery agents can set up their profile in courier delivery app just by filling their e-mail id, name, address and their contact information. They can provide their experience details and upload an image in the profile section. Just like the customers, the delivery agents can rate and review the customers as per their experience. They can also give the feedback in the comment section. The delivery agents can submit any query or complaint in the help section if they face any problem during pickup or delivery time.